Hello and welcome to the MFT February Release Countdown kickoff! All of the amazing new products will be available on Tuesday, February 5th at 10AM EST. 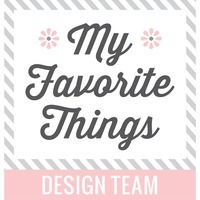 Make sure to stop by the MFT Blog every day for the next five days to see the full reveal. 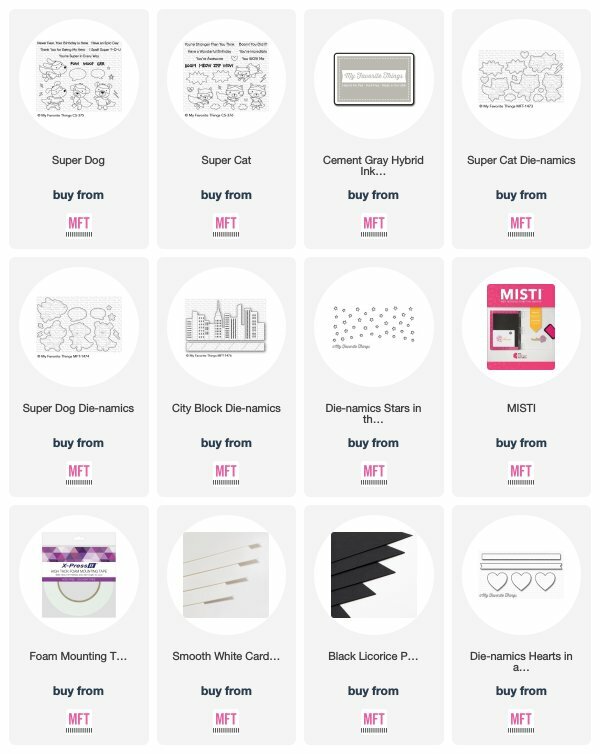 My project today features the dog from the Super Dog, the cat from the Super Cat stamp sets and City Block Die-namics. To begin, I stamped the cat and the dog with the Cement Gray Hybrid Ink for no-line coloring with Copics and cut them out with the coordinating dies. The front panel was die-cut with the stars in the Sky Die-namics- Horizontal and ink blended with Distress Oxides. The skyline was die-cut with the City Block Die-namics using the Black Licorice Prestige Card Stock. The sentiment was heat embossed in white and die-cut with a die from the Hearts In a Row - Horizontal. To assemble the card, I adhered the front panel to a top folding A2 sized card made with Smooth White Prestige Cardstock. After, I adhered the skyline and foam mounted the colored images and the sentiment to the front panel as shown. That's it for today. I hope you enjoyed my card. See you again tomorrow for my Count Down Day 4 project. Really like your no line look in your coloring....it's great! Thanks for sharing! I am in love with these sets Super Dogs and Cats, too cute!!!! Pure delight! 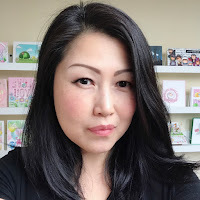 I want to try the no-line technique. I love the effect it gives. Your card is so adorable and the no-line coloring is fantastic! Fabulous. Love super dog and cat. Super cute card!! I love the background colors - it looks like a real city. 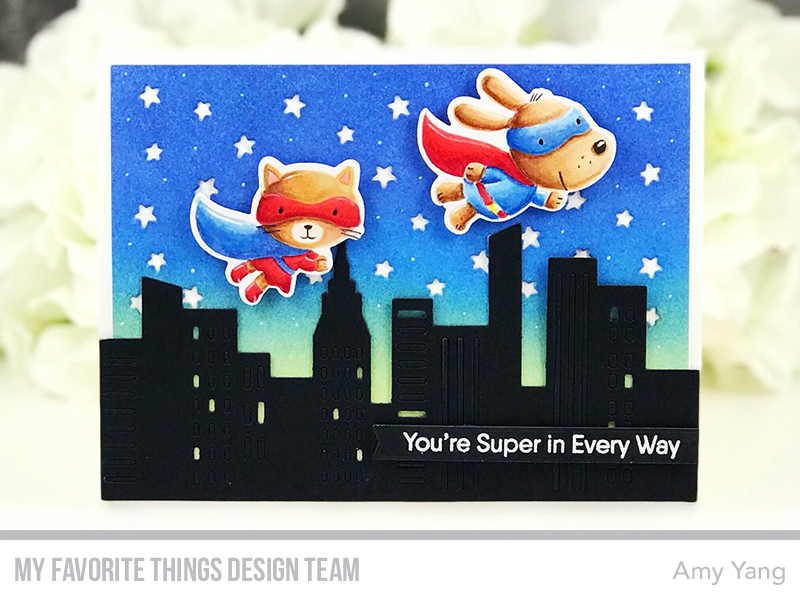 I love the images, super cat and dog. The coloring makes this card super. Cat power! Awesome card and the coloring is wonderful. They are so cute. You do such a nice job on your cards. Gorgeous card Amy! Your colouring is just beautiful! An adorable card, with loads of incredible features for us grown ups to love! 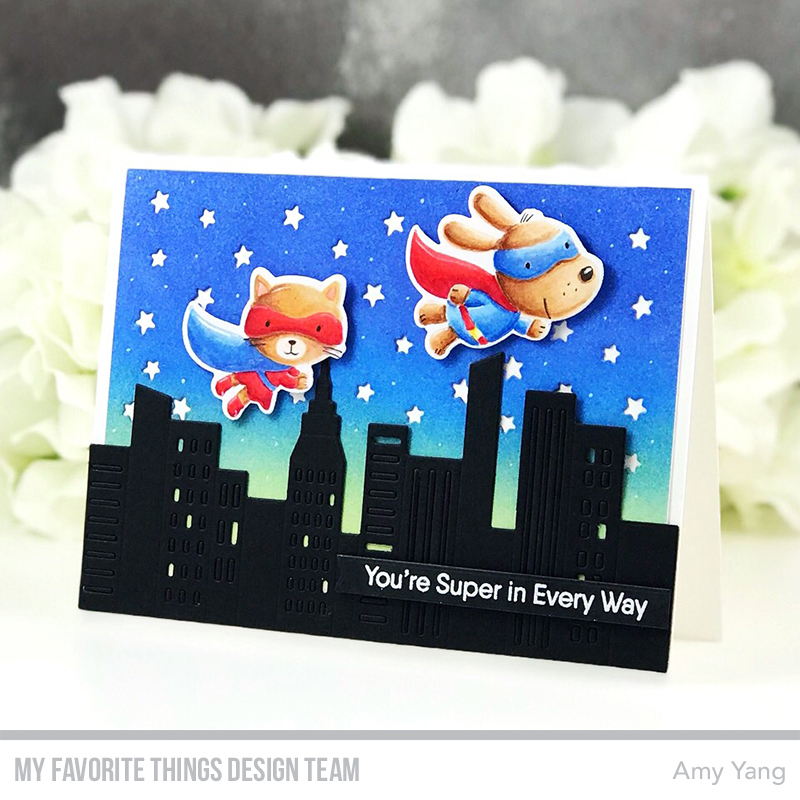 Cute card, really love the skyline die. Super cute card and you're no line coloring is amazing!! 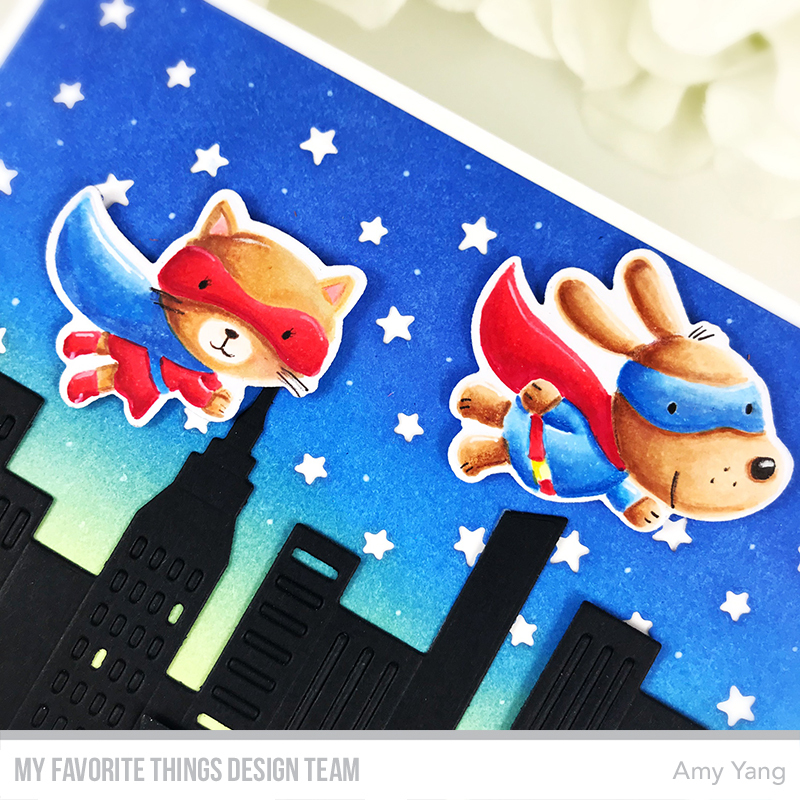 Terrific use of cats & dogs as super heroes! Love it, those super dogs and cats are adorable!! I like how you left some of the paper in the building windows, so that it looks like only a few lights are on in each building. Good idea! Awesome new stamps and dies! Awesome creation! 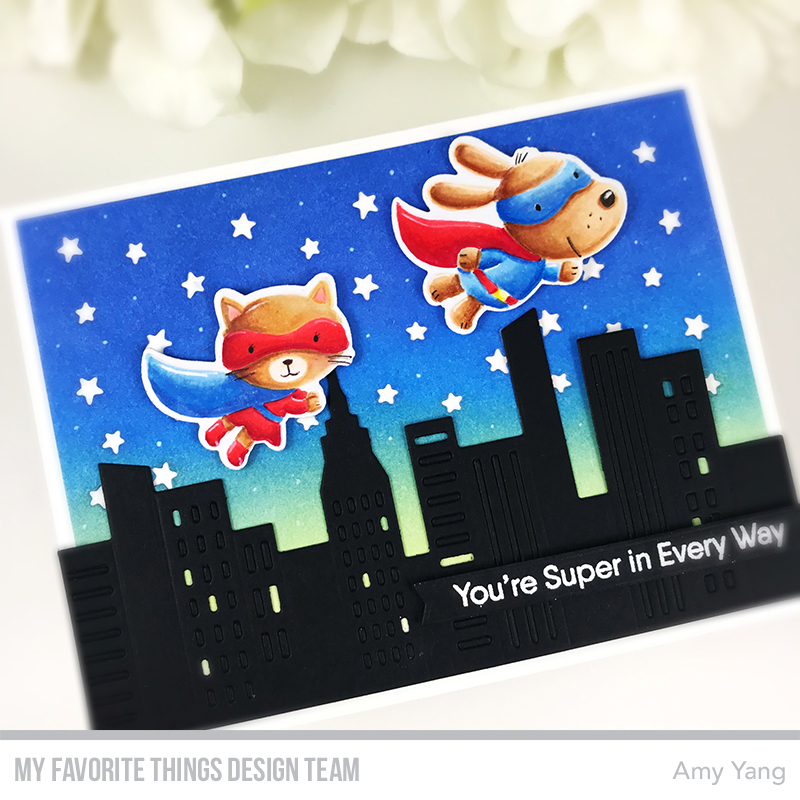 I love your super kitty & puppy! These are so cute. The kids are into super heroes so these are perfect for birthday cards. I like your no line coloring AND your cute card. Wow! Beautiful card. The coloring is amazing! Your card using the animals as super heros is just amazing. Your coloring is outstanding as always. Just love it. My grandkids would love this, they think they are super heroes. Great card, beautiful colors.